Introduces the student to a basic jazz beat, with triplet fills from Drumsense Volume 1 revisited but with hi hat keeping time. The book includes a chapter on "jazz independence" (i.e. snare or bass drum against jazz ride cymbal) which never gets too difficult and is musical and fun for the beginner. The book also covers subdivided 16th note rolls, but with hi hat timekeeping, which gets quite challenging, and a section on basic stroke technique: accents, taps, down and up strokes. 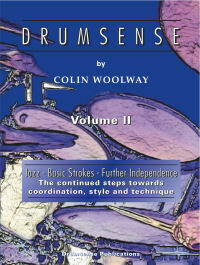 Overall, the emphasis of Drumsense Volume 2 is on timekeeping (hi hat with foot) and technique (basic strokes).